once its domain name is through just going through registration at the moment, i was wondering if i could link this forum on my websites links page? once you have checked the content of course. this might miss the admin's attention....I think we should move this to forum issues to get notice for now. Let me know if you're okay with that and we'll get it moved. You can link to the forum from your site. Or are you looking to do something more involved? I haven't updated our links page for about a year, but I do have about 300 link requests that I'll add at some point. The more links to the site the better. 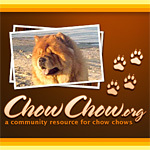 Anything that helps the spread the word for the betterment of the breed and helping Chow Chows that are in need.